To ask other readers questions about Eleanor Oliphant Is Completely Fine, please sign up. Is Eleanor an Aspie? Or on the Spectrum at all? M Rule As someone who has a professional diagnosis of autism which I finally received in my 40s I have been most upset by some comments. Every single…moreAs someone who has a professional diagnosis of autism which I finally received in my 40s I have been most upset by some comments. Every single autistic person is as different and individual as neurotypicals. I would never assume that all neurotypicals are good at social skills or enjoy physical contact just because they aren't Autistic. To suggest Eleanor cant be autistic because she likes holding hands is innacurate. I love to hold my husband's hand or my daughter's hand (Yes, shock horror, I am autistic, married and have a non autistic child!!) However, if a stranger were to touch me or even stand slightly close to me it would cause me huge anxiety. If my husband took my hand unexpectedly I would flinch. All behaviours can vary from day to day as with any human being. External factors as well as the autism itself have a bearing on how my traits present themselves. Also, Austism and it's huge range of traits and behaviours are measured on a spectrum and not a linear scale from severe to high functioning. To suggest its used as an excuse is incredibly insulting. Getting a proffessional diagnosis is an extremely difficult process (especially as an adult) often taking years so to suggest there is some kind of bandwagon is extremely ignorant and ill informed. It took months of interviews with various teams of professionals, my whole family had to be interviewed so they could be sure my issues had been since infancy and I had to get all my old school whixh was almost impossible. My experience is that autism is not over diagnosed but in fact under diagnosed especially in women The diagnostic criteria they use is based on males who often present as having more classic signs than girls. Many autistic people have been victims of abuse and suffer ptsd as a result of being bullied, lonely and living their whole lives feeling disconnected and confused by the world. PtSD and autism are far from being mutually exclusive. IF YOU'VE MET ONE PERSON WITH AUTISM YOU ONLY HAVE ONE EXPERIENCE OF AUTISM. I am still surprised and want to make sure that I am reading it correctly, I just finished and am kind of in surprised. At thirty years-old, Eleanor Oliphant is alone in this world. She always has been, actually. In and out of foster care since she was a little girl, she has never been touched by anyone in a loving way and doesn’t even know what that would 5 Stars. Susanne Strong Dita wrote: "I loved this book, and your endearing review, beyond words. Thank you for your transparency!" Thank you Dita! You are so sweet! I apprecia Dita wrote: "I loved this book, and your endearing review, beyond words. Thank you for your transparency!" Eleanor Oliphant is Completely Fine caught me completely unawares. I'll be honest - I picked it up because it got some buzz and the author is British, but it actually turned out to be one of those perfectl Eleanor Oliphant is completely 100% fine. She goes to her office job five days a week and then treats herself to a frozen pizza and a bottle of vodka on a weekend. She lives alone and doesn't have any friends, but that's okay. She's doing real well, thank you very much. All apologies to my lovely Goodreads friends who have liked (or loved) this book, but it's not for me. And it's sad. . . because I wanted it, I waited for it, and I was finally able to start it. It's Mother's Day, and my family handed me bath salts and my new book and told me to go for it. They know I'm just crazy enough to read an entire book in one bath, and I was ready to do it. And I prepared my bath, and I began reading, and I was (very quickly) almost in physical pain No. No. No. No. No. No. And I prepared my bath, and I began reading, and I was (very quickly) almost in physical pain. I don't mean to be rude to the author; I know how hard it is to write a novel and get it published, but this would not have made it past my eyes, if she had handed it to me. Again, ALL APOLOGIES, but this is Mother's Day, and you have one annoyed mother on your hands. You have ruined my bath, and in doing so, you have released the Kraken!! MUST the reader be invited in to experience every one of Eleanor's bowel movements and meals? MUST we suffer through every not-interesting-in-the-least observation on life? And, how must we EVER believe that a woman this bizarre would be able to function in the world and/or experience a friendship or a romance? According to Eleanor, she has "white contours of scar tissue that slither across my right cheek." Here's where I just about threw the book. Explain. No, seriously. Explain how scar tissue slithers across a face. Do you mean as you are speaking or making funny faces? Did you attend Hogwarts? Are you a Slytherin? Help, please! Also. . . somehow. . . Eleanor hangs up phones quietly. But, it's 2017, and we all just use that little button now. There's no loud, there's no quiet, there's just that one button. Explain. Oh, and when she hangs up the phone with her Mummy (choke and gag), "It was only when the air went dead that I noticed I'd been crying." How does the air go dead? No, I'm not kidding. Please, explain what that sounds like, what it looks like. How does the air go dead? If you want to read about a WAY more adorable person with Asperger's. . . go find Don Tillman. If you want to read about a WAY more delightful curmudgeon, go find Olive Kitteridge. If someone asks you how you are, you are meant to say FINE. You are not meant to say that you cried yourself to sleep last night because you hadn't spoken to another person for two consecutive days. FINE is what you say. Ohhh, I could not wish for a more perfect book. Eleanor Oliphant is an office manager at a company. She's worked there for years and yet...she's never fit in. The other girls at the office like to whisper and giggle - oftentimes at Eleanor - and the rest of them just think she's plain weird. These days, loneliness is the new cancer – a shameful, embarrassing thing, brought upon yourself in some obscure way. But all that changes when she meets Raymond, an IT guy at the office. They certainly don't hit it off, but they do have a connection of sorts. Raymond manages to get a peek at what's underneath Eleanor's shell...and he might just be able to pull her back before she really goes too far. I have been waiting for death all my life. I do not mean that I actively wish to die, just that I do not really want to be alive. Whew. After reading this one - I feel like I need to sleep for a week! Gail Honeyman expertly weaves a story steeped with humor and love. Eleanor was such an off-the-wall character - never over the top, but always just enough to be an absolute delight. LOL could go and take a running jump. I wasn’t made for illiteracy; it simply didn’t come naturally. I adored Raymond's gentle prying and Eleanor's slow acceptance of other people. This story is just so perfect - everyone needs to pick up their copy - Right. Now. In the end, what matters is this: I survived. As you can deduce from the title, Eleanor Oliphant is completely fine. Or, so she thinks. But, by most people’s standards, I’d say not. When you first meet her, it’s hard not to feel overwhelmingly sad for Eleanor. Maybe even to pity her a bit. Eleanor is simply existing in a lonely and somber life without friends or family. And let’s be honest, at times her bluntness is sort of off-putting. Eleanor is just fine living by her own self-imposed routine. The hour-long lunch spent with the same sandwi As you can deduce from the title, Eleanor Oliphant is completely fine. Or, so she thinks. But, by most people’s standards, I’d say not. Eleanor is just fine living by her own self-imposed routine. The hour-long lunch spent with the same sandwich and the daily crossword puzzle. The nightly pesto dinner recipe. The Friday treat of frozen pizza and wine. And the vodka, lots and lots of vodka—her coping mechanism for the long and lonesome weekends. The epitome of socially awkward, Eleanor is oblivious to social cues and norms, uninhibited by a filter, quite literal, and extremely frugal. At thirty, she’s set with her one and only job—no ambition for anything better or more challenging on the horizon. Laying eyes on “husband material” sparks her desire for a metamorphosis of sorts. She figures landing her soulmate is going to require some work—new hair, clothes and maybe even a little makeup to hide her facial scarring. After all, being with a musician requires a certain poise. There are scars on my heart, just as thick, as disfiguring as those on my face. I know they're there. I hope some undamaged tissue remains, a patch through with love can come in and flow out. I hope. It’s actually a happenstance run-in with one of her coworkers and the ensuing friendship that inspires the most change in Eleanor—her outlook on life and interactions with people. It’s comical that Raymond doesn’t seem fazed by Eleanor’s stunted social skills. In fact, his mellow attitude and companionship go a long way to smooth her edges. When things don’t go to plan, Eleanor is forced to stare down her truth. To succumb to the reality that everyone has problems and no feeling is insurmountable. That eventually with time—not vodka—things will get better. It's the why behind it all that broke my heart. Gail Honeyman balances the heavy—and there’s a lot here, so be prepared—with humor and hope; taking readers on a journey right along with Eleanor. My own feelings skewing from odd to charmed. Quirky Eleanor managed to chip off a piece of my heart, stowing it away in her trusty shopper for safekeeping. With a pair of pom-poms in hand, I stood on the sidelines cheering Eleanor on as she discovered what life is truly about—living. Connecting with others. Taking those much-needed pauses to drink in her surroundings. And the potential for more in each and every aspect of life. From broken soul to a woman on a mission to live life, Eleanor's is an inspiring story, one I know I’m better for reading. Eleanor’s story hit me so much harder than I expected it to. She is thirty years old, has worked at the same job since she left university, speaks on the phone to mummy once a week 4.5! What an incredible story! 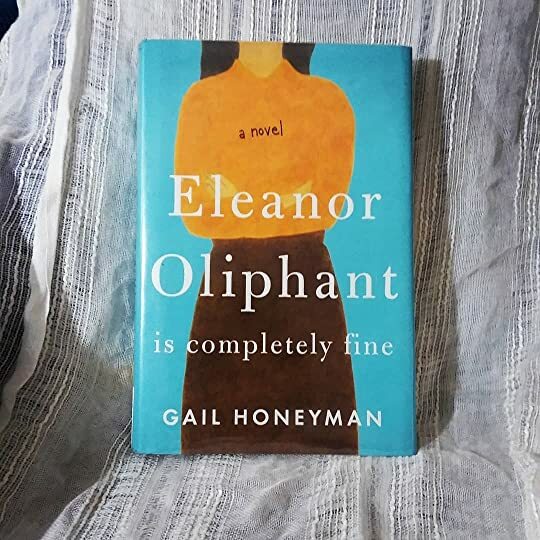 I'll admit, when I started reading Gail Honeyman's debut novel, Eleanor Oliphant is Completely Fine , I thought about issuing a moratorium on quirky characters who can't seem to pick up social cues or are oblivious to how people usually behave when interacting with peers, coworkers, those who provide service, and others. Obviously these are colorful characters to write about—it seems as if the literary world is full of them. But the more time I spent with Eleanor Oliphant I'd rate this 4.5 stars. Eleanor lives by her routines. She eats the same meals, wears the same clothes, has her weekly chat with Mummy, and has her weekend rituals, which include frozen pizza and enough vodka to keep her pleasantly drunk all weekend. For the most part, she eschews interactions with her coworkers, whom she mostly thinks are daft and lazy. They make fun of her both behind her back and in front of her, and she doesn't really care. "I do not light up a room when I walk into it. No one longs to see me or hear my voice. I do not feel sorry for myself, not in the least. These are simply statements of fact." Two things happen which throw her routines off-kilter. First, while attending a concert with a coworker, she spots a handsome musician and is quickly smitten. She has decided that he is the one for her, and starts to ready herself for their first encounter, during which she knows he'll sweep her off her feet and they'll live happily ever after. She needs a makeover and new clothes, and she starts doing research on her soon-to-be-beloved. Meanwhile, one afternoon she and Raymond, the IT guy from her office, whom she considers poorly groomed and a bit bumbling, save the life of an elderly man who falls in front of them. Saving Sammy's life suddenly gives Eleanor two unexpected relationships, friendships, that she has never had before. She still acts the way she believes to be appropriate, and says things that most wouldn't, but she begins liking the feeling of belonging, of companionship, which she never realized she wanted. "Some people, weak people, fear solitude. What they fail to understand is that there's something very liberating about it, once you realize that you don't need anyone, you can take care of yourself. That's the thing: it's best just to take care of yourself. You can't protect other people, however hard you try. You try, and you fail, and your world collapses around you, burns down to ashes." Eleanor's social awkwardness, her lack of a filter, her inability to grasp exactly how people expect her to behave, actually hides a great deal of secret pain, pain and memories even she has hidden. And when she is forced to start recognizing just what a burden she has carried for so much of her life, and who was responsible, it threatens to break her. Suddenly she realizes she may need to do something she never has—depend on others, and reveal things about herself she's always kept hidden, in order to move forward. If she wants to. Eleanor Oliphant is Completely Fine is really a special book. Even if some of Eleanor's behaviors are similar to other quirky characters you might have seen, she is totally unique, and while off-putting, just absolutely wonderful. You both marvel and are saddened by the burdens she has carried, and how she copes with them. I found myself becoming protective of her, worrying there would come an instant where someone made a total fool out of her (with her own help, of course). Honeyman really did a terrific job with Eleanor. Even as she began letting down her guard, Honeyman kept her character consistent, but never let her become unsympathetic. While this is certainly Eleanor's story, I liked the other characters as well, although they certainly didn't get as much attention. I thought the ending was a little too pat for my taste, but I really enjoyed this overall, and don't think I'll be forgetting Eleanor or her story anytime soon. God bless the people who challenge our notions of "appropriate" and "normal," because they are what keeps our world interesting! Eleanor Oliphant lives a fairly secluded life due to her lack of social graces and crippling self esteem and anxiety issues. She works at a graphic design firm in the finance department and spends the rest of her time at home, usually drinking. Her social life consists of a phone call with her mummy every week. Then one day she goes to a concert, for which she won tickets in a raffle, and falls in love at first sight with a musician. Eleanor decides to make some changes to herself as part of a p Eleanor Oliphant lives a fairly secluded life due to her lack of social graces and crippling self esteem and anxiety issues. She works at a graphic design firm in the finance department and spends the rest of her time at home, usually drinking. Her social life consists of a phone call with her mummy every week. Then one day she goes to a concert, for which she won tickets in a raffle, and falls in love at first sight with a musician. Eleanor decides to make some changes to herself as part of a plan to get her dream man. Meanwhile a new hire in the IT department of her company, Raymond, strikes up a friendship with Eleanor. As things change for Eleanor she is forced to confront the past and confront the real reason for her recent desire for more. What an absolutely fantastic character Eleanor is, a character that grew on me the more I read. She has had a scarred childhood, though we don't learn exactly what happened until later in the story, she wears the evidence on her face. She remembers little from that time only knows she was burned in a fire. Raised in a series of group homes, given an apartment by social services who still check on her though she is now thirty. She has few social skills, is very matter of fact, has no friends, few What an absolutely fantastic character Eleanor is, a character that grew on me the more I read. She has had a scarred childhood, though we don't learn exactly what happened until later in the story, she wears the evidence on her face. She remembers little from that time only knows she was burned in a fire. Raised in a series of group homes, given an apartment by social services who still check on her though she is now thirty. She has few social skills, is very matter of fact, has no friends, few filters and has a schedule that she keeps to, a job she likes and insists she is fine. Until a crush with a musician and an IT guy named Raymond derails her schedule and her life. Why did I give this five stars? It is a first book, with nary a misstep, an assured book with amazing writing and character development. Plus it is difficult to take a book with so few characters, and not only make it interesting enough to keep the reader immersed, but to let us see the way Eleanor changes and grows throughout the story. There is much humor, there is also sadness and I came to embrace this character in all her strangeness, loved when she figured things out and came to terms with her past. There are a few places where the author could have gone overboard on sweetness but she kept true to the character of Eleanor and just managed to stay on the border, without crossing over. This is a book I will remember, it was that good and meaningful, in my opinion. Looking forward to great things from this new author, she is a true talent. Thanks to my friend Esil who told me to grab this one. What an emotional roller coaster, this book! I laughed. I thought about crying. I was angry. I was delighted. I was empathetic. I was completely fine, sometimes. What started out as a book that could have easily been called A Woman Called Eleanor ended up being far superior to that Ove stuff. There were legit moments that made me laugh, and the book turned in directions that were hard to get through, assuming you have a heart inside your chest that beats about 65bpm as mine does. A heart that fe What an emotional roller coaster, this book! I laughed. I thought about crying. I was angry. I was delighted. I was empathetic. I was completely fine, sometimes. What started out as a book that could have easily been called A Woman Called Eleanor ended up being far superior to that Ove stuff. There were legit moments that made me laugh, and the book turned in directions that were hard to get through, assuming you have a heart inside your chest that beats about 65bpm as mine does. A heart that feels emotion and pumps blood at the same time. Have you one of those? Are you human? This could have easily been just a three-star, that was nice, thanks, see ya later kind of book. It wasn’t. It was a cut above that because it had memorable characters and situations and relationships and conditions and events and circumstances that made it a more powerful book than I anticipated. The last third of the book was heavy. This thing took me all over the place emotionally... and physically. I mean I guess I physically took this book all over the place since I read it on my phone and also listened to the audiobook. Whatever. I didn’t read the synopsis. I just liked the cover and people I like liked the book so I just went for it. I’m glad I did. I should go for more things in life. Take more risks. That’s what life is all about. Taking risks and reading books without knowing too much about them. Life is also about other things, too. Some of those other life things can be found in the pages of this book. Others can’t be found in any book because they just have to be experienced in, you know, real life. Experiences are good. At first it’s easy to think that Eleanor is just a quirky social misfit with no friends and no social life and she is, but I soon found out that there is so much more to Eleanor and so much more to learn about her. It’s a lonely life she leads and she says everything is fine but we learn eventually that it isn’t, and that life hasn’t ever been fine. While hints of what happened to her are slowly divulged, we never really find out everything until the end . It’s heartbreaking to learn why she dro At first it’s easy to think that Eleanor is just a quirky social misfit with no friends and no social life and she is, but I soon found out that there is so much more to Eleanor and so much more to learn about her. It’s a lonely life she leads and she says everything is fine but we learn eventually that it isn’t, and that life hasn’t ever been fine. While hints of what happened to her are slowly divulged, we never really find out everything until the end . It’s heartbreaking to learn why she drowns herself in alcohol and fantasizes about a guy in a band, wanting a guy to love her, scars and all, the ones on the outside and those in her heart. Here is a novel at the exact room temperature everyone likes, not too cold, not to hot, just right, it’s like Goldilocks finding the right bed, everybody jumps in and goes right off to sleep, no one has a bad word to say, the Guardian loved it, the Irish Times said it “hits the accessible literary sweet spot”, Costa Book Prize, Reece Witherspoon to star in the movie, five stars rain down upon Eleanor Oliphant on Goodreads until she can no longer be seen, buried beneath tons of billowy love. If T Here is a novel at the exact room temperature everyone likes, not too cold, not to hot, just right, it’s like Goldilocks finding the right bed, everybody jumps in and goes right off to sleep, no one has a bad word to say, the Guardian loved it, the Irish Times said it “hits the accessible literary sweet spot”, Costa Book Prize, Reece Witherspoon to star in the movie, five stars rain down upon Eleanor Oliphant on Goodreads until she can no longer be seen, buried beneath tons of billowy love. If The Beatles could reform they would issue a single immediately called “All You Need is Eleanor Oliphant”. Our story is a simple one. Eleanor is the poster girl for loneliness and social isolation caused by having a frightful childhood resulting in a truly traumatic event (no spoiler : a house fire). Eleanor is 30 and has zero friends, less than zero family, a poorly paid job, doesn’t speak to her co-workers, doesn’t even have a cat or a dog or a budgie or a little worm as a pet. Not even a little tiny worm! Eleanor has a ridiculously pompous conversational style. So unfamiliar with normal human interaction is Eleanor that she has not realised that most people do not want to be spoken to as if they are in a posh drawing room in the 1950s. It’s like she has lived without tv or radio or newspapers or magazines or anything. “You don’t need to stay long – just show face; have a cup of tea, eat a sausage roll – you know the drill.” Said Raymond. “Well I hope they’ve at least got a high meat content and friable pastry, “ I said. I will assume the mantle of care… This creature will be looked after assiduously. Yes, it’s quite funny, but now, come on Gail Honeyman, no one is as loopy or brusque or unaware as that. Even Eleanor would know her remark was inappropriate, embarrassing, too much information – even if she meant it to be funny, which she didn’t, because, like any Vulcan, she has no sense of humour. She is the source of the humour but never understands why anyone is laughing. It did occur to me that Eleanor was somewhere on the autism spectrum but that is never alluded to in the novel. Has Gail Honeyman created an Asperger Syndrome character without realising it or is she just playing Eleanor for some pretty easy laughs? I had absolutely no idea what she was talking about but I let it pass. Eggs, bacon, orange juice and Nurofen tablets. I had to stop myself from leaning forward and explaining that he was wasting his money – this branded non-steroidal anti-inflammatory drug was in fact ibuprofen 200 mg, the generic version of which was readily available for sale at perhaps one-quarter of the price. For 70% of the time this novel is gentle comedy, of the sort you can find in sitcoms like Not Going Out or The Vicar of Dibley if the Vicar had a brain injury. But then begins the process of Eleanor thawing out and assuming a more “normal” shape. The great thing about this novel now emerges. This novel believes in ordinary human kindness as the thing which can save us, and not romantic love, and that is a great message which is very rarely heard. But the normalising of Eleanor has some disturbing aspects. Quite often it’s like a rerun of Georgy Girl, the folksy hit by The Seekers from 1966. And the dowdy feathers are indeed shed – cue humorous sketches involving bikini waxes, new hairdos and new clothes. “But Miss Oliphant… you’re beautiful!” is almost said by at least two characters. Well. I absolutely don’t want to kick this novel down the cellar steps and have it look back up at me all begrimed with cobwebs and sing "Where is Love?" through big blobby tears. I love the gospel of ordinary human kindness here, even though it’s wrapped up in some fairly disgraceful looksism and evangelical therapyspeak towards the end. I argued myself up down and sideways about Eleanor Oliphant and finally copped out with a rueful three stars. This is a nice novel. I should be nice to it. I dare you not to think Elephant when you hear this title. This writer is so clever! We've got the first part of elephant at the beginning of her first name, and the rest of the elephant in the last name. No, of course this book is not about elephants, but the writer sometimes plays with words--and that alone is a selling point for me. Maybe it's sort of like subliminal advertising, except the author isn't trying to sell us elephants. Eleanor Oliphant. Elephant elephant elephant! I can get all an I dare you not to think Elephant when you hear this title. This writer is so clever! We've got the first part of elephant at the beginning of her first name, and the rest of the elephant in the last name. No, of course this book is not about elephants, but the writer sometimes plays with words--and that alone is a selling point for me. Maybe it's sort of like subliminal advertising, except the author isn't trying to sell us elephants. Eleanor Oliphant. Elephant elephant elephant! I can get all analytical and talk about how Eleanor--the fact that half of her face is badly scarred and that no one knows (or dares to ask) how she got that way—is the elephant in the room. (In fact, the author makes a pun once, referring to an Oliphant in the room.) And like an elephant, Eleanor Oliphant indeed fills the room, even though she would prefer that no one see her, that everyone leave her alone. The world is too scary to her and she is the poster child for anti-social behavior. In one venture she is completely delusional--she thinks her crush on a famous person will lead to marriage. She is a riot, but she has no idea she is. It's also true that she's sad and feels isolated and unlovable. Formal, literal, awkward, and very very funny in her skewed world view, are also part of her package. Routines, crossword puzzles, and vodka are her mainstays. I usually like oddball characters; Eleanor is definitely one of my favorites. Her character is so well-drawn, I'll remember her I'm sure. This book sure isn't all laughs and all light by any means. This is also a dark book. Something awful happened to Eleanor when she was a kid, and throughout the book we get hints about what it is. The ending had a very clever surprise that made me shake my head in wonder. I loved it. The middle of the book dragged a little for me, which made me call it a 4-star read at first. (I just had to change my rating to 5 stars, though--the book is just too damn good and I can't get Eleanor out of my head.) Eleanor has a hilarious adventure in a salon early on (one I just have to reread), and there's a lot of other funny energy. Absurd situations described in language that hopped, gave me the feeling that I was on an amusement ride. The author seemed “on”, jazzed up, and I couldn’t get off the ride even if I wanted to. Of course, I wanted the book to keep up that level of hilarity, and it didn't. Still, Eleanor was relentlessly fascinating, both her public, regular side (that’s a poor choice of words because there is nothing regular about Eleanor) and her private, dark side. Here is the review I wrote right after I read it. I realize - almost a year later I can still remember so much about this story: ELEANOR is a terrific character ... and this book is great!!! Even GROWS on you!!! uniqueness that only she can claim. Eleanor goes to the same office job - M-F 8:30 to 5:30 every day. She works as a finance clerk. She takes an hour lunch break. We know her weekday supper routines and her weekend menu. Weekends are frozen pizza, vodka, and phone chats with Mummy. Eleanor's life changes after she meets Raymond, a co-worker IT guy. His sloppy -unkempt style doesn't bother Eleanor-she never had any friends to begin with and she wasn't a fashion queen herself. and bond together in a heartwarming friendship. This story really makes you realize how valuable one friend can be. Eleanor had been stuck in ways she didn't even have the eyes to see - let alone do anything about it. But it's Raymond -his goodness- that ultimately helps Eleanor mend her broken heart....by helping her face areas of her painful childhood she has avoided. The story is broken down into three sections:. Tender- touching - and plenty of heart. This is another book that I read last year… The book was given to me last summer. I wrote a review but I have no idea where it is. Eleanor Oliphant is one of the heroines of literature that I am sure I will remember always. She is brilliant, yet socially awkward. At the age of 10 she experienced a trauma that she never received any help with to sort through it. So, she repressed her memories and more importantly, she repressed her emotions. By the age of 30, she was so good at repression that it completely froze parts of her being and the underlying, unacknowledged fear of any of her repressions getting out were the root ca Eleanor Oliphant is one of the heroines of literature that I am sure I will remember always. She is brilliant, yet socially awkward. At the age of 10 she experienced a trauma that she never received any help with to sort through it. So, she repressed her memories and more importantly, she repressed her emotions. By the age of 30, she was so good at repression that it completely froze parts of her being and the underlying, unacknowledged fear of any of her repressions getting out were the root cause of her lack of social skills. When dealing with intellectual matters, she is formidable; her vocabulary and the facts at her fingertips are beyond many people’s comprehension. Yet even as she grew and matured, some parts of her remained in the stunted, closed-in world of her 10-year-old self. Despite everything she had experienced, with both physical scars and those on her psyche, not once does Eleanor feel self-pity or get caught up in, “I am a victim”. She simply does not see herself that way and it is one of the reasons I admire her as a character to be honoured and respected. At her workplace, she meets the new IT guy Raymond, and her critique of him is definitely offhand and dismissive. Although they do eventually become friends, Eleanor has her sights set on someone else – far more glamourous, exciting, and sophisticated. When her world takes a nose dive, she is wise enough to know it is because of her own poor decisions based on influences from her past, and she takes brave measures to turn her life around with help from her friend Raymond. Her long and slow recovery is a testament to the human soul’s willingness to strive and thrive against all odds. I found this book to be a compelling read, funny in places, deadly serious in other places, but always, always buoyed by Eleanor’s determination and resilience. It was rewarding to watch her friendship with Raymond grow, and his support of her is inspiring. Eleanor Oliphant is a thirty year old accounts receivable clerk who has a humdrum existence. She calls herself a self contained entity, eating lunch alone while doing crossword puzzles and spending every weekend alone with bottles of vodka. She feels freakish and ugly since she has scar tissue across her right cheek, a result of third degree burns suffered during childhood. She speaks to Mummy by phone every Wednesday. Eleanor lives with the only item to have survived her childhood, her parrot p Eleanor Oliphant is a thirty year old accounts receivable clerk who has a humdrum existence. She calls herself a self contained entity, eating lunch alone while doing crossword puzzles and spending every weekend alone with bottles of vodka. She feels freakish and ugly since she has scar tissue across her right cheek, a result of third degree burns suffered during childhood. She speaks to Mummy by phone every Wednesday. Eleanor lives with the only item to have survived her childhood, her parrot plant, Polly. Having been raised from age ten in the foster care system, she has no appropriate social skills. Society has kept her fed, clothed and educated, but unloved. Mummy's phone calls are hurtful and abusive. Mummy tells Eleanor that she's let people down, can't be trusted and that her facial scars show the past living on her face. Despite this criticism, she embarks upon a mission to find a boyfriend or husband. This will keep Mummy happy. Eleanor decides to change her outward appearance to attract dreamy rock musician, Johnnie Lomond. Raymond,a co-worker from the IT department of her office, starts a budding friendship with Eleanor after both of them assist an accident victim. Through Raymond's kindness and ministrations, Eleanor's inner emotions and feelings slowly start to emerge. She revisits her childhood memories with help from Raymond, her first real friend. Confronting her past will enable her to change the trajectory of her life. Eleanor Oliphant had a tumultous, mindboggling upbringing. Her journey is one of hope for a better future, a future fought for and won by facing her demons and disassociating herself with the perpetrator(s) of abuse. "Eleanor Oliphant Is Completely Fine" by Gail Honeyman is an excellent debut novel. Oh, Eleanor! How delightfully quirky you are! This book..well..let's just say was one of the most unusual and gratifying journeys that I have ever been taken on in the literary world. Thank you, Gail Honeyman for creating such a wonderfully, unique character that is Ms. Eleanor Oliphant. And that name? I.N.C.R.E.D.I.B.L.E. I'm not going to attempt a summary of this book because that would seem slightly gratuitous. Therefore, I will simply say, that this novel is a character study of a woman, that Oh, Eleanor! How delightfully quirky you are! This book..well..let's just say was one of the most unusual and gratifying journeys that I have ever been taken on in the literary world. Thank you, Gail Honeyman for creating such a wonderfully, unique character that is Ms. Eleanor Oliphant. And that name? I.N.C.R.E.D.I.B.L.E. I'm not going to attempt a summary of this book because that would seem slightly gratuitous. Therefore, I will simply say, that this novel is a character study of a woman, that is so unique, that I couldn't properly give a summation of her in words. This book, however, was not just rainbows and lollipops..it was much, much more. I just loved Eleanor! She is a loner and avoids social interactions and lives in isolation. She speaks out without thinking, to whatever pops in her mind. She has never received hugs, or held hands and has never felt loved, she never received anything when she was sad to cheer her up. Never received balloons and received a balloon from Raymond with Sponge Bob on it and it was so special to her. She never heard of Sponge Bob. She had an awful childhood with a scar on her face and bruise 4.5 stars! She had an awful childhood with a scar on her face and bruises would show up all over her body. She had an emotional traumatic past. She was bought up in foster homes and then gets herself her own apartment from a social worker. She then meets Raymond and things start to change for her, she finally meets a friend. She is in love with a famous musician. That is how quirky she is, she actually wants a relationship with him. Her relationship with Raymond builds and it works for her. She then goes through counseling and things come together and she remembers everything that happened in her traumatic past. She is changing and turns out being very brave. She is so humorous. I just loved Eleanor. This book really made me feel so many emotions!! I laughed, I cried, tears running down my face. I cheered for Eleanor near the end. I loved this book. It really made me feel! I just loved Eleanor. It was a slow burn but the book started building suspense when I read about her scar on her face and had to find out why. Then it got me turning the pages to find out what happened. I was so surprised when I found out what happened. It was so sad and heartbreaking what she went through. While I was reading this I thought it was a whole different genre in what I usually read, it wasn't a thriller but it was the mystery of what happened that turned this into a page turner. Once all the pieces came together, I fell in love with this book. I can understand why it was a little slow, you needed to really get to know Eleanor. Once I started loving Eleanor that is when it started getting really good. I then couldn't put it down. Eleanor will make you laugh, she will make you cry, and she will have you cheering her on. If you love a book that will make you feel, this is the one for you!! I loved it. eleanor oliphant may be completely fine but i, on the other hand, am not. sigh. ugh. i feel so bad for not really enjoying this. this was the debut heard around the world, the debut that won numerous awards. and i saw so many people rave about this nonstop. but i think that was where i went wrong to begin with. the book blurb did not sound interesting to me in the least, so i probably shouldnt have picked it up to read just because everyone else was. next, eleanor drove me up the wall. im talking eleanor oliphant may be completely fine but i, on the other hand, am not. sigh. next, eleanor drove me up the wall. im talking about driving me absolutely bananas. and i am definitely one of those people who if they dont like the character, then the book will be a massive struggle. which was the case here. especially because this story is almost completely character driven. theres not a whole lot going on the with the plot, so what drives most people to finish the book is desperately wanting to know ‘what happened to eleanor?’ and i did too, but not because i cared about eleanor as a character. only because i have an incessant need to know everything. lol. overall, i understood the message of the story, and whilst i agree that it was a good one in theory, it didnt personally impact me as much as i would have liked. just too many things got in the way, i suppose. but yay for everyone else who loved this - you all are much more patient and understanding than i am! Eleanor Oliphant is lacking the social awareness that would have her filter her comments, or even consider for a moment that she needs to do so. She’s a unique individual with a unique view on the world and how it works – especially as it relates to people. ”Animals, birds and insects can provide such useful insights. If I’m ever unsure as to the correct course of action, I’ll think, ‘What would a ferret do?’ or ‘How would a salamander respond to this situation?’ Inva !! NOW AVAILABLE !! Approaching 30 years old, Eleanor is a charming, quirky, socially naïve, emotionally awkward young woman who leads a lonely life, she has worked in the same office for eight years now, in the same job, a finance clerk. She has her routine down and no aspirations for the future of rising in the ranks. An hour for lunch, her crossword puzzles, her weekly conversations with Mummy, these are the constants of her life. Variations in routine send her into a momentary tizzy; too many deviations send her reaching for her vodka. She avoids socializing, but will make an appearance as needed for a work related event, but only to avoid more unwanted attention that she would undoubtedly be subjected to should she choose not to attend. Ideally, she would prefer to blend in with the paintings on the walls, the furniture, the woodwork. That is, until she sees him, the man Mummy always told her would be right for her. For him, she might risk being seen. When she requires IT help at work, she meets Raymond, she does a quick assessment of his grooming and wardrobe shortcomings, while he is new enough not to be put off by her awkwardness, he leaves her feeling as though he views her as normal – which in itself is an oddity in her workplace. In the awkward getting-to-know-you phase of a work friendly relationship, Raymond and Eleanor happen to be in the right place at the right time, at least for Sammy Thom, when they see him collapse in the street. Suddenly, they are thrust into Sammy’s life, sitting bedside at his hospital bed, hoping for his recovery, meeting his family, and becoming an extended part of Sammy’s family. Eleanor is prodded into forsaking her routines, stepping outside of her comfort zone once Raymond and Sammy enter the picture. She begins to feel noticed in a good way, and begins to try to believe in life, in goodness. Believe in someone besides Mummy. Although this covers some rather calamitous childhood events, it is done without any sensationalism. It incorporates some of the coping mechanisms, as well as some of the causes of the physical and emotional scars of her childhood. Eleanor Oliphant shows us the significance of kindness, the consequence of the absence of kindness, and the magnitude of even a small gesture of kindness. A wonderfully uplifting debut novel! 4.5 stars! Oh Eleanor, I desperately wanted to reach into this story and hug you (even though a hug would be extremely awkward for you) and welcome your quirky self into my life! Eleanor’s journey took me on a roller coaster ride of emotions. Eleanor is obliviously socially awkward. She had me laughing out loud on one page and then holding back tears while breaking my heart on the next. Eleanor Oliphant is one of the most remarkable characters I have ever ‘met’! Eleanor’s inner thoughts (and ofte 4.5 stars! Oh Eleanor, I desperately wanted to reach into this story and hug you (even though a hug would be extremely awkward for you) and welcome your quirky self into my life! Eleanor’s journey took me on a roller coaster ride of emotions. Eleanor is obliviously socially awkward. She had me laughing out loud on one page and then holding back tears while breaking my heart on the next. Eleanor Oliphant is one of the most remarkable characters I have ever ‘met’! Eleanor’s inner thoughts (and often her outspoken words) had me giggling throughout every chapter. Her relationship with her mother and memories of her childhood had me cringing and shaking my head in disbelief. While reading this book, I couldn’t help comparing it to the quirkiness of The Rosie Project which I absolutely loved. I just couldn’t help but smile and melt at Eleanor’s rationalizations for each of her thoughts and actions. She is quite a woman! "These days, loneliness is the new cancer – a shameful, embarrassing thing, brought upon yourself in some obscure way. A fearful, incurable thing, so horrifying that you dare not mention it; other people don’t want to hear the word spoken aloud for fear that they might too be afflicted, or that it might tempt fate into visiting a similar horror upon them." I couldn’t help but think that the above presumption somehow rings quite true in this day and age. If we look around and see so many interacti "These days, loneliness is the new cancer – a shameful, embarrassing thing, brought upon yourself in some obscure way. A fearful, incurable thing, so horrifying that you dare not mention it; other people don’t want to hear the word spoken aloud for fear that they might too be afflicted, or that it might tempt fate into visiting a similar horror upon them." I couldn’t help but think that the above presumption somehow rings quite true in this day and age. If we look around and see so many interacting personally with their cell phones rather than one another, and think about the hordes of people sitting at home in front of the television watching mindless shows or playing video games, and those of us… ahem, sitting at our computers alone but attempting to engage with others online – I am nearly convinced that loneliness could very well be a disease of this technologically advanced century. Eleanor Oliphant certainly knows something about loneliness. In fact, it was this issue that really stood out for me the most in this novel. I mean, yes, there are a number of other problems to reflect on here as well – alcoholism, mental abuse, and physical abuse for starters. And then it seems we could also touch on Asperger’s. In fact, I think you could open up a copy of a DSM-5 if you had one handy (I didn’t) and slap quite a few official diagnoses under Eleanor’s name. However, I really don’t mean to make light of any of Eleanor’s problems because even just one of these would be enough to make me feel for this quirky and solitary soul. Initially, Eleanor is a bit unlikeable… judgmental, aloof, and not always very nice – she just might tell you exactly what she thinks. She is also quite funny… not purposefully, of course, but I dare you not to laugh about some of her observations! In the very least, you may nod your head. "I do feel that tube tops are best suited to the under twenty-fives, if, indeed, they are suited to anyone." And then she little by little grows on you as you learn her story and you not only sympathize with her, you might actually find yourself caring for her and cheering her on. There are a number of excellent reviews out there so I won’t dwell more on Eleanor’s personal history or the plot here. The balance seems to be overwhelmingly tipped in favor of this book, but there are some fantastic reviews that also sit on the other side of the scale and are well worth their weight. There were some things that bugged me while reading this - a number of inconsistencies in Eleanor’s character, for example. She would say one thing and then act in an opposing manner. An unbelievable love interest comes to mind immediately. And what about the vodka binge drinking? "Vodka is, for me, merely a household necessity, like a loaf of bread or a packet of tea." Does one quit this without a recovery process? Are there no withdrawal symptoms? Okay, enough said about that. However, despite several of these inconsistencies, I could not help being entirely charmed by this novel! I seriously adored Raymond! I like to think that there really is that nice guy (or gal) out there that will make a difference in someone’s life – a person who doesn’t necessarily shine when you first glance at him or her, but one with that unassuming presence whose friendship is truly priceless. My personal enjoyment of the book as well as the importance of bringing the issue of loneliness into the forefront are what tipped the scale in the right direction for me. I’ve heard a lot of good things about “Eleanor Oliphant is Completely Fine, “ but I must admit I was somewhat reluctant to read it. I’ve recently read several novels about social misfits like Eleanor and felt like I needed a break from that type of character. Also, Gail Honeyman is a debut author whose work was only discovered through a writing competition. (How good could she be?) I decided to give Eleanor half an hour, but after only ten minutes of reading I was totally hooked and my reluctanc I’ve heard a lot of good things about “Eleanor Oliphant is Completely Fine, “ but I must admit I was somewhat reluctant to read it. I’ve recently read several novels about social misfits like Eleanor and felt like I needed a break from that type of character. Also, Gail Honeyman is a debut author whose work was only discovered through a writing competition. (How good could she be?) I decided to give Eleanor half an hour, but after only ten minutes of reading I was totally hooked and my reluctance and skepticism were thrown out the window. Despite the tremendous amount of pain Eleanor has experienced, the book is funny, poignant, charming, touching, joyful, and an absolute wonder. Finish whatever you’re currently reading and without delay start “Eleanor Oliphant is Completely Fine.” All those rave reviews are right - Gail Honeyman is an exceptional author and this is a novel not to be missed. I'm starting to get a little concerned here because so far, 2018 has bestowed upon me nothing but amazing books and I fear I'm going to have to pay for this streak of good luck at a later date. My heart, without a doubt, has been hijacked by Eleanor and is nowhere to be found. But you know what, Eleanor, take it. Take whatever’s left of it. It’s all yours because you've given me a blissful (and I'm starting to get a little concerned here because so far, 2018 has bestowed upon me nothing but amazing books and I fear I'm going to have to pay for this streak of good luck at a later date. Eleanor completely snuck up on my emotions and her story overall touched me in ways that I never expected. I became so attached to her that when I was nearing the end I dreaded reading the book because I wasn't ready to say goodbye yet. There are a number of books out there about various types of mental health issues, however, not many that talk about profound loneliness as the central plot point. Enter, Eleanor Oliphant is Completely Fine. This novel will emotionally gut punch you while making you smile and laugh, then comfort you with moving words until it decides you've had enough laughter and... back to the punches again. What a beautiful rollercoaster. I loved this book. It took a while, but I fell in love with it. I finished reading it whilst I was at a cafe and realised how much of a trance I was in when I looked up and noticed my surroundings. This is the story of Eleanor Oliphant, a 30 year old woman who's suffered a lot. The tone of the book is quiet, steady and slowly reveals her life to the reader. You can sense something traumatic has happened, but you're unsure, because Eleanor is unsure. Slowly, it is uncovered, and thus this is the I loved this book. It took a while, but I fell in love with it. I finished reading it whilst I was at a cafe and realised how much of a trance I was in when I looked up and noticed my surroundings. This is the story of Eleanor Oliphant, a 30 year old woman who's suffered a lot. The tone of the book is quiet, steady and slowly reveals her life to the reader. You can sense something traumatic has happened, but you're unsure, because Eleanor is unsure. Slowly, it is uncovered, and thus this is the journey we follow. In between all of that, we look at her life. We're inside her mind and perceive her world the way that she sees it, with humorous and witty observations about pretty much everything that catches her eye. You laugh, but also feel this sense of sadness for her, because she's alone most of the time. But she's fine, or so she thinks. The story looks at the concept of loneliness extremely well. It hurts to read, but the reality of the matter is, loneliness is not healthy as we all know. This is different to solitude, but the need to connect with another human being is strong and innate in this book, and if not met, can cause damage to ones psyche. It was painful to follow Eleanor on this realisation that she was alone. Has been for most of her life. So how does she fix this? How does she battle the demons that've been buried for so long? TigerLily the only thing that's putting me off is, shallow as I may sound, is the "unhygienic IT guy" who is mentioned in the blurb. Warda TigerLily wrote: "the only thing that's putting me off is, shallow as I may sound, is the "unhygienic IT guy" who is mentioned in the blurb." TigerLily TigerLily wrote: "the only thing that's putting me off is, shallow as I may sound, is the "unhygienic IT guy" who is mentioned in the blurb." TigerLily wrote: "ok, after your review I really need to read this..."
When I first picked this book up, I was battling with some mental health issues of my very own. I only quite recently realised I had any when a friend pointed it out; and all the years of struggling - my thoughts, emotions and behaviour started to make sense. Funny thing is, I had decided to read this one thinking it was going to be a fun, light read and it will cheer me up. Little did I know how deep and relatable it was going to turn out. Initially, I could only manage a couple of pages at a t When I first picked this book up, I was battling with some mental health issues of my very own. I only quite recently realised I had any when a friend pointed it out; and all the years of struggling - my thoughts, emotions and behaviour started to make sense. Funny thing is, I had decided to read this one thinking it was going to be a fun, light read and it will cheer me up. Little did I know how deep and relatable it was going to turn out. Initially, I could only manage a couple of pages at a time because it's all my brain could take; and I didn't want to overwork myself. But the more I read, the more I wanted to know about Eleanor. Though she took me a while to warm up to, I really got to know her and like her as a person. And now I just adore her! She was a wonderful character and seemed so incredibly REAL to me that at times I forgot I was reading a work of fiction. It felt like I was literally inside her head with her thoughts and emotions. She was funny, quirky, so odd at times and yet SO relatable. I identified and connected with Eleanor on a personal level because I too, know what the darkness feels like; the hollowness and loneliness. I know it all too well. I felt angry and hurt for Eleanor and for what she went through. Her mother was an incredibly vile woman. But I got to see her grow and blossom beautifully; and it was so heartwarming to be a part of it all. I found myself thinking of Eleanor when I wasn't reading, and then would want to pick it up just so that I could be a part of her thoughts and her day. Reading for me in some ways is an escape from my issues because it makes me feel better. I started this book in a state where I felt at my lowest, but finished it in a better one. Partly because I really enjoyed the book and mainly because I finally decided to confide in my friend. Just like Eleanor, I bottled things up. But I think it's very important to let someone know about how you feel. And I'm glad I picked this one up because it made me smile and laugh and I had a wonderful time reading it. I didn't realise this until now but I'm actually going to miss Eleanor Oliphant. And she most definitely, and completely, is fine. I passed on this book when it first came out, but after seeing all the 4 and 5 star ratings from my Goodreads friends I decided to give it a go. It took a while for me to connect with the story. The first 80-100 pages were slow, and I wasn’t sure if I was loving the rather off-putting protagonist enough to enjoy her tale. Eleanor is a young woman living in Glasgow who suffered a horrifically traumatic event at age 10 and spent the rest of her childhood in one foster home after another and finally in an orphanage. She makes the best of things and decides she is completely fine as a scar-faced independent person with an OK job and her weekend bottles of vodka. Who needs friends and family when you are completely fine without them, right? Then she unexpectedly finds herself in a situation where she thinks she might like to impress somebody. As practice for this “project” she begins to expand her horizons just a bit and surprises herself by enjoying these new experiences. And when a normal work colleague doggedly coaxes her into a friendship, it is nothing like she has ever experienced before. That is when the book started reeling me in. After that point, I was totally hooked and read the vast majority of the book in 2 days. Unheard of for me. Wow, Ms. Honeyman constructed a jewel with this debut effort. Her writing style is beautiful and most appealing. She also drops an interesting new (to me) word every 3 pages or so. I was reading a hardback so kept my online dictionary nearby at all times in order to see exactly what these cool words meant. I love learning new words. She also knew when to inject a dose of humor into this emotive story. Watching Eleanor learn about all the wonderful human-y things she has been missing in life is profoundly moving. She is like a chrysalis, just waiting to bloom. I appreciated the author not going over the top with Eleanor’s journey; the characters and the story are portrayed very realistically, adding to the brilliance of the book. I must throw in that I thought the scenes of Eleanor with Maria Temple were particularly well done. This story is many things. It is both wrenching and full of heart. It is deeply touching. It is dark, yet inspiring. Most of all, it is one of those few books one reads that is truly unforgettable. 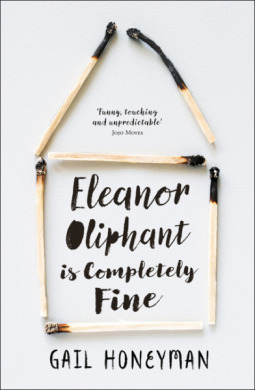 I highly recommend Eleanor Oliphant is Completely Fine to all.